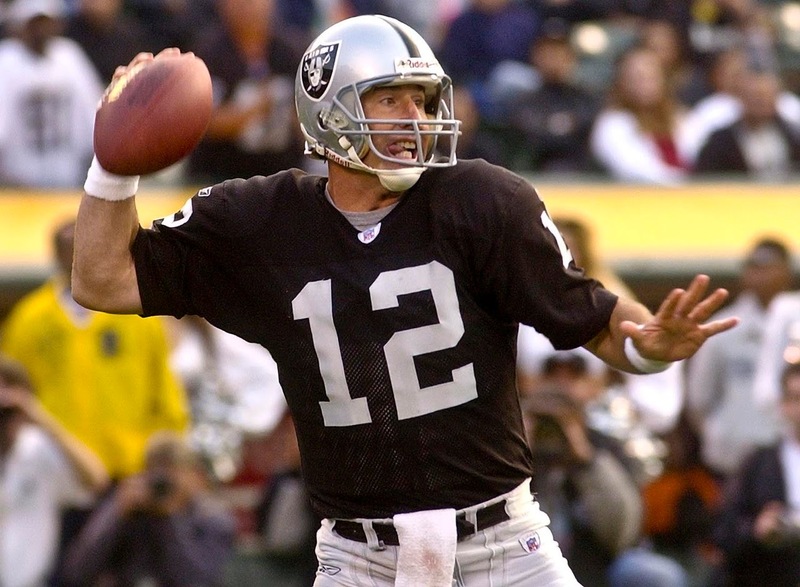 Our Adam Lowenstein spoke with current CBS commentator, former NFL quarterback, and guy I always thought was going to bite off his own tongue, Rich Gannon. Ed. Note- Correspondent Adam Lowenstein won the California Almonds Ultimate Bro Snack Sweepstakes he entered earlier this year at Gillette Stadium, and his prize was a 15-minute phone conversation with CBS Sports commentator Rich Gannon. Adam spent most of that conversation talking football (duh), though the conversation did take place before yesterday's NFL action. Still, he got to speak with a former NFL quarterback, and we think that's pretty cool, so we're gonna run this a day after the fact and adjust records accordingly. Enjoy! Earlier in the week, I had the pleasure of speaking with CBS commentator Rich Gannon about a lot of the goings on in the National Football League as we head into Week 10. The former quarterback and I discussed quite a few storylines, but the most intriguing conversation that we had was about what most deem the league’s best division, the NFC West. Although the Seattle Seahawks and San Francisco 49ers have both underachieved thus far this season, the Arizona Cardinals own the league’s best record at 8-1, and Rich does not think that this will change any time soon. “The Cardinals are going to win the division” Gannon said when asked how he sees the NFC West shaking out. However, Gannon does see a weakness in Arizona’s rushing attack, which ranked 28th in Football Outsiders’ DVOA heading into Week 10. Andre Ellington, who was arguably the league’s most efficient rusher in 2013, has been able to handle a big workload without suffering any major injuries this season, but his yards per carry have dropped severely with him touching the ball 24 more times (plus a kick return) in eight games this season than in 15 contests in his rookie campaign. It will be interesting to see if Ellington will kick off the second half of his season on a good note against the above-average St. Louis Rams’ rushing defense. As for the second-place Seahawks, Gannon likes them as the other playoff team coming from this division. In Week 9, they were without several starters, which was one of the reasons they were unable to blow out the Oakland Raiders. Gannon had some thoughts on Seattle's apparent regression from Super Bowl form this year. “It is a lot different when you are applying the pressure from when you are getting the pressure,” Gannon said. As the defending champions, Pete Carroll’s squad is now the ‘big game’ on everyone’s schedule, and that was most evident on October 19 when the Seahawks were at the Edward Jones Dome in St. Louis. Behind a couple trick plays, the Rams were able to defeat the Seahawks, 28-26. Seattle has since bounced back with two victories, but Gannon notes that there have been fewer large-margin victories for the team this season. However, since Gannon tabs the Seahawks’ secondary as the best in the league, he sees several more victories for them this season as long as “Russell Wilson gets rid of the ball quickly” behind his injured offensive line. The now 5-4 49ers rebounded well from their frustrating loss at the hands of the Rams by defeating the Saints in overtime. Although Gannon does not think that San Francisco will make the playoffs, he still saw the squad as “much better than” the 4-4 record they brought into New Orleans. This is because he is a fan of the 49ers’ upcoming schedule. They will now take on the New York Giants and Washington Redskins, and Jim Harbaugh’s team should be favored in both of those games. Then, San Francisco plays Seattle twice within three weeks with the winless Raiders sandwiched in between the divisional contests. Gannon believes the 49ers can take down the Seahawks “if they play well.” In most scenarios, the two teams will split their series, so it is important for Colin Kaepernick and company to take advantage of their non-NFC West opponents. As for the pesky 3-5 Rams, injuries have put them in a large hole, so according to Gannon, their chances of making the playoffs are slim to none. However, he mentioned that the team has turned up its defense, especially with its strong performance against the 49ers. Unfortunately, St. Louis' passing defense DVOA is the worst in the NFL. This might not be the year for the Rams, but they have the pieces and coaching staff to put together a run to the postseason sooner rather than later. While the Rams will most likely be watching the playoffs from home in January 2015, they are the only NFC West team with multiple intradivisional wins this season; they will still have chances to act as a spoiler in what should be a very interesting NFC West race. Thank you to Rich Gannon for a fantastic interview. For more sports coverage, follow Adam Lowenstein on Twitter at @StatsAdam.